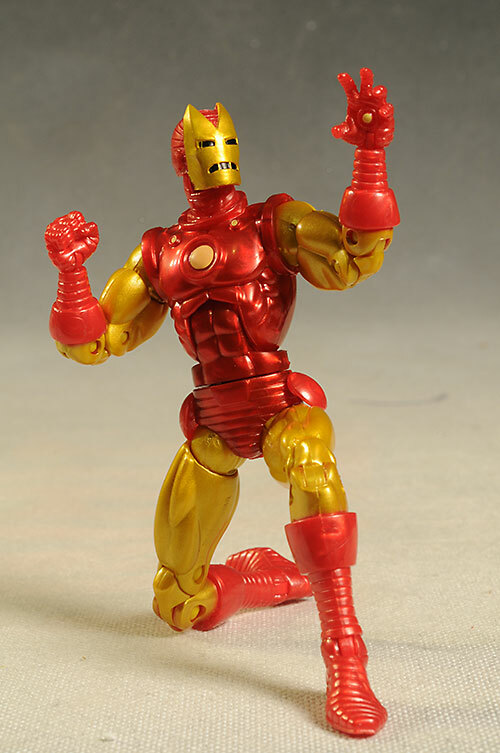 With Iron Man 3 coming out this year, you can bet your bippy that just about everything released by Hasbro under the Marvel banner is going to have something to do with Iron Man. Such is the case with their Marvel Legends, and the Iron Monger BAF wave. 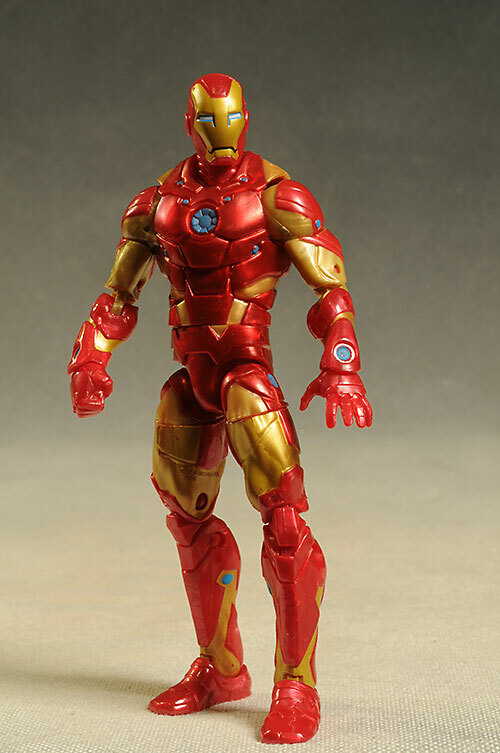 Only three of the figures are out now - Classic Iron Man, Iron Patriot, and Heroic Age Iron Man. The other three are yet to be named, and will be out later in the year, allowing you to complete the larger Monger. These three are showing up at most mass market retailers, like Target and Toys R Us, where you'll spend around $16 each for them. It's the usual Marvel Legends card backs with a slight update to the graphics and an Iron Man theme. A big plus is no twisties this time around. Not only do they have the Iron Man 3 style, they include an Avengers logo in the top right corner. Nothing excites the Marketing department like cross promotion! 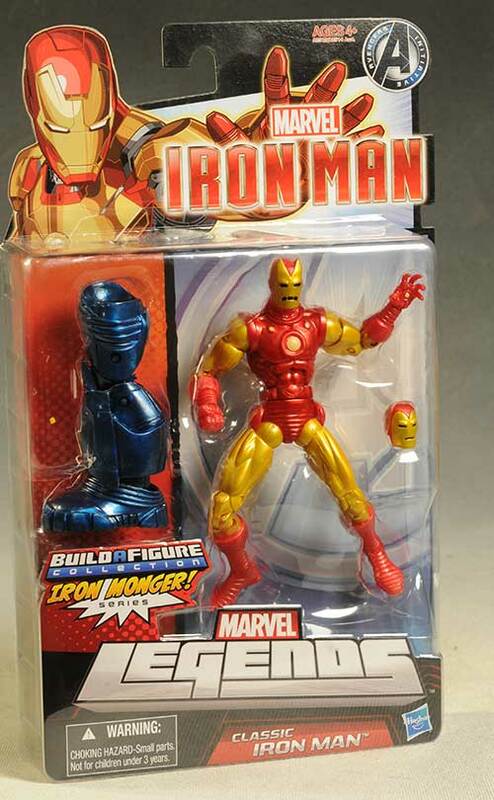 I like the look of all three of these, especially the Classic Iron Man. The are iconic designs, and all three are very well executed. The Heroic Age is really a modern version of course, and the bulkier look is much more realistic. You can actually believe this is a suit of armor over a man's body. The two others are more classic, when the artwork didn't really account for a full figure under thick armor. That's okay by me, since it was the style of the time, and reminds me of the comics of my youth. All three run around 6 1/4" to 6 1/2", fitting in great with other past Marvel Legends waves. While the paint work is good, it's not perfect. There's a few fuzzy cut lines, and some of the colors run from one into another. But the metallic appearance of the paint looks great, and the bright colors really pop. Small details are fairly well done, especially on the Heroic Age version. The gold color is fairly consistent in coverage, and the shiny finish sets it off nicely from the slightly duller red. 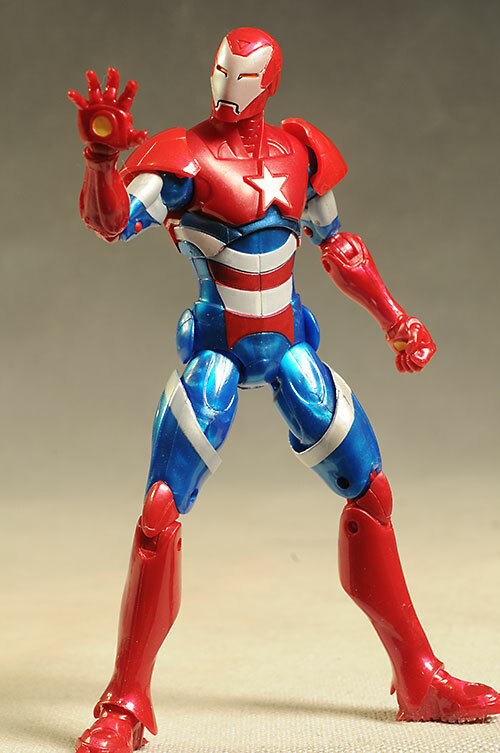 The bright red, white and blue of the Iron Patriot looks good as well, with only a few issues here and there. There's some sparkle flecks in some areas of the red and blue as well, making him the most dazzling in terms of color. 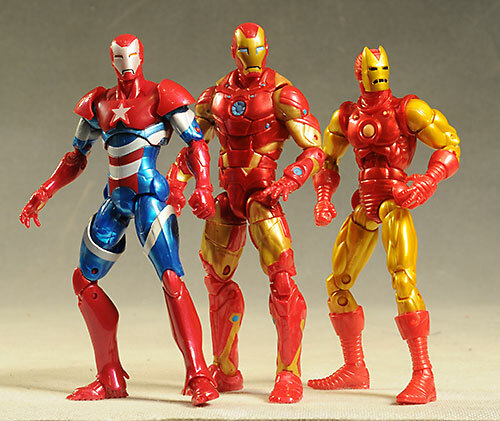 All three are well articulated, although the Iron Patriot has a bit of a modified body that's slightly less so. There's all the usual ball joints, including the neck, shoulders and hips. Double pin elbows and knees, pin wrists, a cut waist, an ab-crunch, cut thighs, pin ankles, and some more I'm probably forgetting, all come together nicely to allow for plenty of poses. 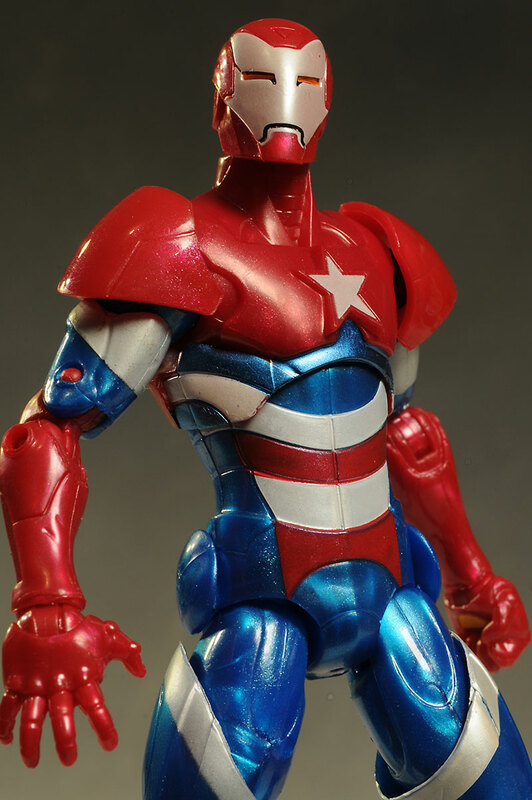 The Iron Patriot lacks the cut thighs, and his sculpt does tend to make some of the joints a bit more restricted, but he still takes a ton of flowing stances quite easily. Unfortunately, there's not a lot in the extras department. All three do have a piece to the larger Iron Monger BAF. 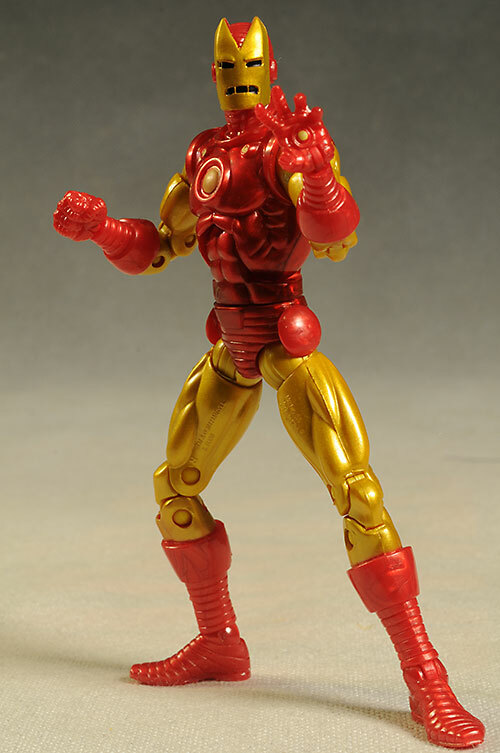 Classic Iron Man gets a leg, as does Heroic Age Iron Man. 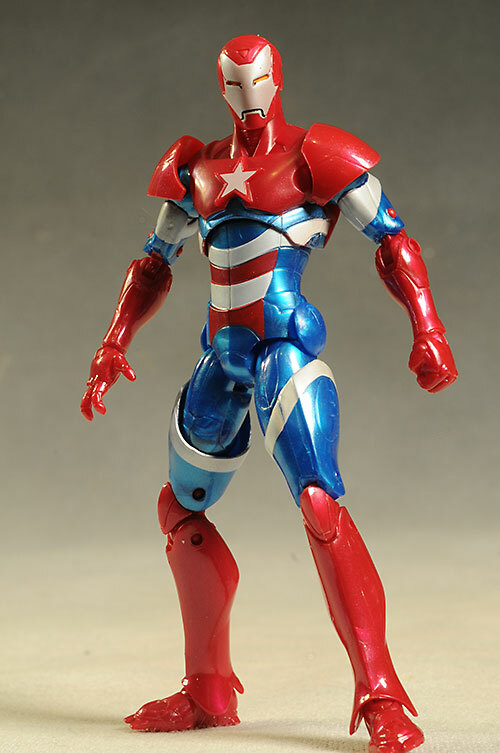 Iron Patriot has the torso. Of course these pieces only matter if you're planning on completing the figure. I am, so I'm giving the figures Accessories credit for having them. 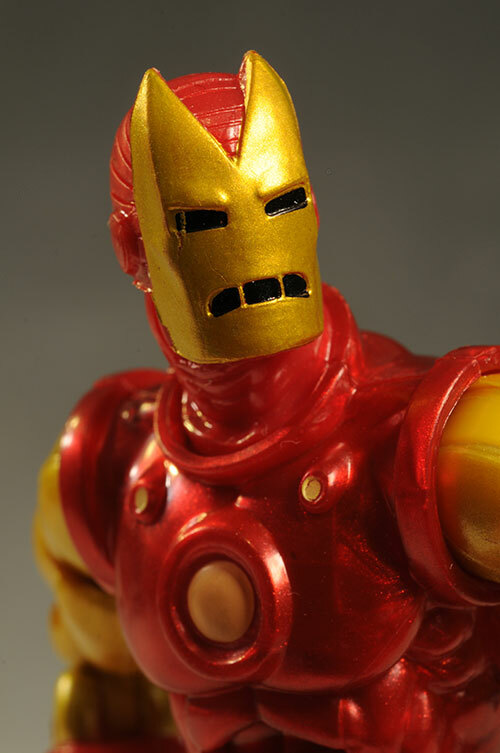 The only figure to come with something extra is the Classic Iron Man, who has an alternate head. It pops on and off easily, and both look terrific. 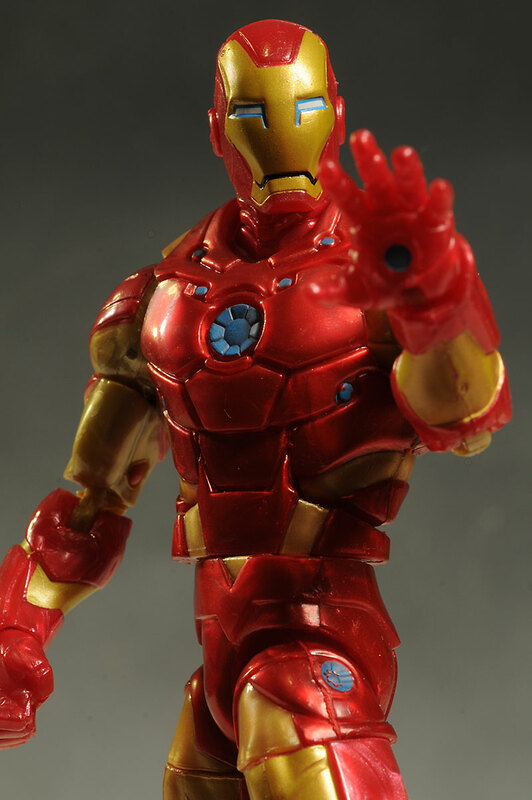 The articulation and design make Marvel Legends one of the best action figures currently on the pegs. The only rivals are the DC Unlimited, and while the name might imply otherwise, they're pretty limited in terms of distribution right now. I just can't see a $16 price tag on these. Teenage Mutant Ninja Turtles are an inch or so shorter, but come with a ton of extras...and cost about $9. 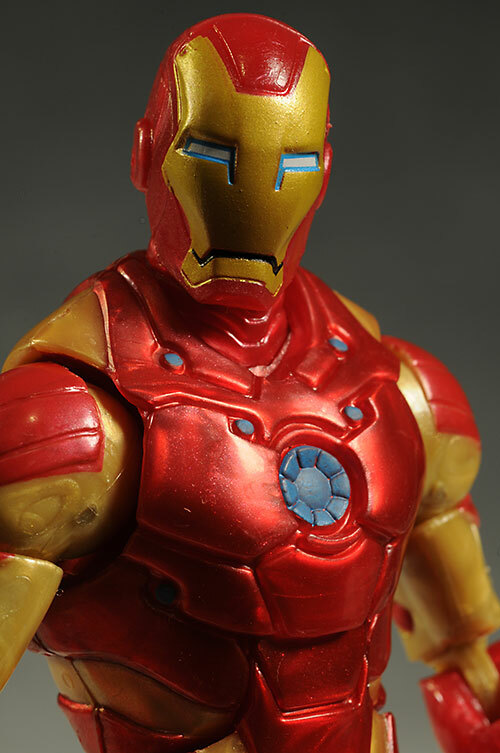 It's all about the numbers of course, since they aren't making nearly as many of the Marvel Legends figures these days, but convincing someone to spend $100 on the Iron Monger is going to be tricky. Nadda - no problems here. While I'm a bit disappointed that we may have to wait months before we can finish the Monger, I do like these three Iron Men. If I could only have one, it would be the Classic, but both the Heroic and Patriot look and pose great as well. 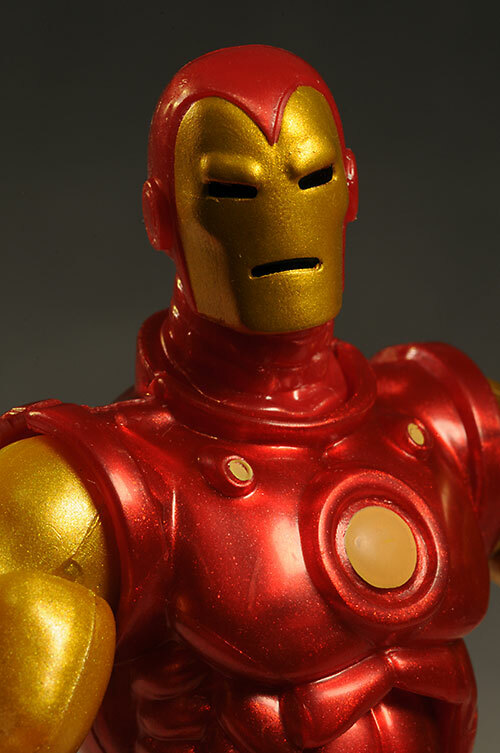 Of course, the price tag is a bit of a turn off, but most collectors are sadly getting accustomed to paying that much for many 6 - 7" scale figures. If you're one of those numb to the inflated prices, you'll probably be quite pleased with these. There's not a lot on the pegs of the local stores that interests me these days, so the occasional wave of Marvel Legends is always a nice surprise. Your best bet is to hit the local mass market retailer, like Target or Toys R Us, where these are showing up for around $16 each. It's been awhile since I had a wave of Marvel Legends to review...all the way back to the Arnim Zola series for me. You can see part 3 of that wave here, along with Part 2 and Part 1. Before that, I covered the Terrax BAF wave, in part 1 and part 2. - prior to that, the last series I remember reviewing was the Red Hulk set, in part 1 and part 2. - Then there was the last wave of 'icons', the larger scale Legends. - before that, there was the Foom/Hulk wave, broken into one review here and another here. - I never did look at the third wave of Hasbro ML's, but I did cover wave 2 and series 1, first at MROTW and then at QSE. - you’ll want to check out my review of the other four figures. - Hasbro released several of the 12″ Marvel Legends Icons, including Punisher and Doom, and my favorite, Thor. - in the 12″ Icons line, there’s Spider-man and Beast, Wolverine and Venom. - The Face Offs series 1 (with Hulk/Leader in one review and the other two sets in another) and series 2 both had guest reviews. - there’s the guest review of the Fearsome Foes of Spider-man boxed set, Urban Legends box set, X-men Legends boxed set, and the Fantastic Four boxed set, along with my review of the Monsters boxed set. - The previous Sentinel BAF was guest reviewed. - prior to that there was Wal-mart series, series 13, series 12, series 9 (including Galactus), series 8 Captain Marvel and Doc Ock, series 7 Vision, series 6 Juggernaut, Wolverine and Deadpool, series 5 Blade, Nick Fury, Sabertooth and Colossus, along with series 5 Red Skull, Silver Surfer and Mr. Fantastic, series 4 Goliath, Punisher, Beast, Gambit, and Elektra, series 3 Daredevil and then the rest of the series, series 2 Thing and Namor, and finally, from three and a half years ago, the series 1 review.